I had a good chuckle yesterday when George’s aunt asked me how the weekend was and I replied, “We had a good weekend, but um…I don’t remember what we did. It was a long time ago.” By the time Wednesday rolled around it took me a minute to even recall what we did just three days prior. I’m going to plea the Quad Mom card on that one. After a short pause, I was able to recall our weekend and it was in fact a good one. Over the past week, we had plenty of bright spots worth remembering so here are the little things! I totally snagged the idea of feeding the babies Ritz from Amber. They LOVED them! Funny thing, the boys crammed them in their mouths like Cookie Monster while the girls nibbled them like little ladies. We are just steps away from a food fight and tea party, I think. 2. Around the time I went on bed rest, our Peke-aPoo, Sasha became sort of lethargic. She turned out to be a fantastic bed rest buddy since she loved to snuggle and sleep the day away with me. When the babies trickled home, Sasha, retreated to our closet most days only coming out for short bursts of time. We chalked it up to her getting older and having trouble adjusting to her new siblings. Several weeks ago, Sasha’s allergies flared up and she got horrible skin irritations all over her body. At first our vet thought it was just her allergies again, but did a blood panel to check. She discovered Sasha had a tick disease (who knows why since we keep her on flea/ tick preventatives). Anyways, she’s been on a round of antibiotics for four weeks and a few days a go she turned a corner. OMG- Sasha is a new dog! Our seemingly cantankerous dog has become spry and friendly again. We love having our Sasha back! 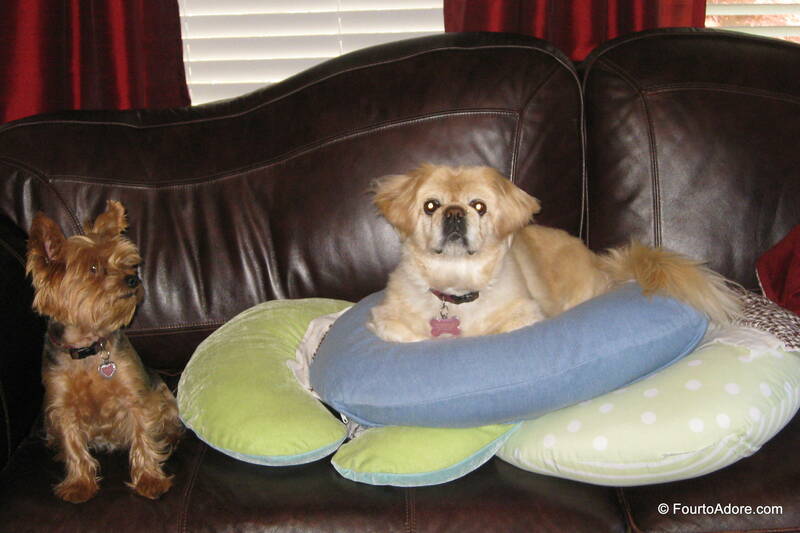 I put the Boppy pillows on the couch to vacuum and this is what happened next. On the brighttside, Sasha got the gumption to jump up there and be in the den with her family. 3. 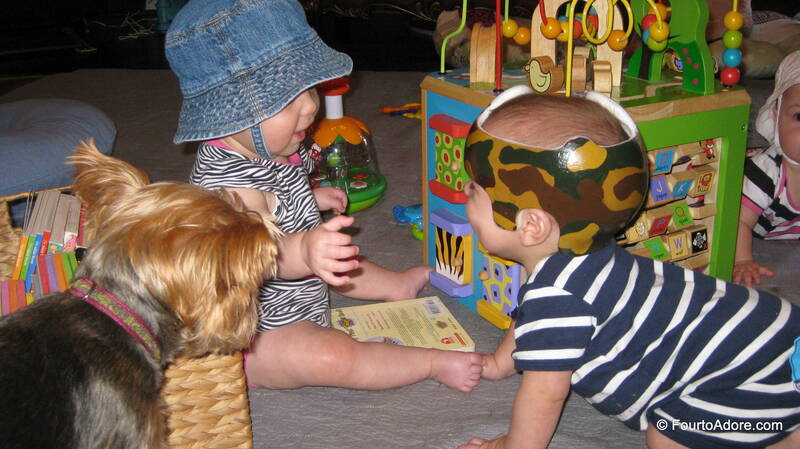 The babies had their nine month check up this week and in good quad mama fashion, I recruited a reinforcement. This time, our family friend, Terri helped me schlep the babies to see Dr. Knapp. She’s helped me numerous times and knows the drill perfectly. Our appointment went flawlessly and we were done in about 45 minutes. That meant we had some time before the spoon feed. Spontaneously, I asked Terri if she were up for a Costco run. With a glimmer in her eyes she happily accepted the challenge. 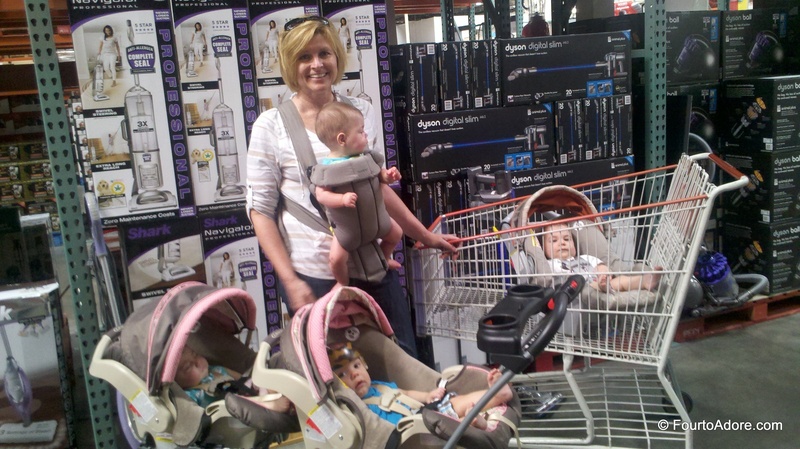 The babies were angelic in Costco and we replenished supplies in under 35 minutes. Not only did Terri come along for this shenanigan, she rocked the Baby Bjorn WHILE pushing the twin stroller! She did a fantastic job fielding questions while Harper and I got to business. I’m thinking I ought to get her to help me do weekday Costco runs more often. 4. 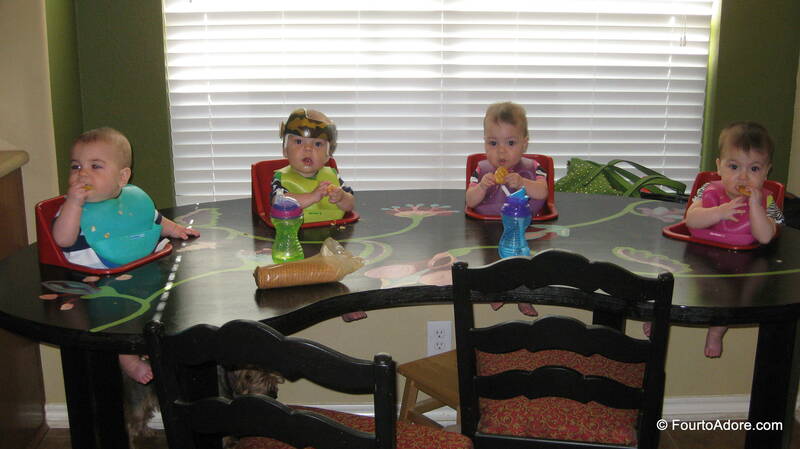 The babies are becoming increasingly aware of each other and often “entertain” their siblings. It’s a blast to watch! After nearly six weeks, Rylin, Harper, and Sydney are suddenly aware of Mason’s band and reach out to pat it or give it a good luck rub. On the downside, Mason thinks it’s a thrill to gently ram others with his band….oh boy! Stay turned for more on our home becoming Fort Knox! Mason and Rylin have really been cracking each other up lately. I mean huge cackles and guttural belly laughs. 5. I know this is totally irritating by now, but don’t forget to vote again for the Top 25 Moms of Multiples Blog contest. I really wish it was a vote once sort of thing, but it’s not so that means we have to keep soliciting votes to stay on top. We hang around 2nd through 6th place. At least it’s easy, just two clicks every 24 hours. What little things brightened your week? Can you remember back that far? Glad they like the ritz!! Good job on Costco, we need to hit up Sams soon for birthday supplies. The ritz was a great idea. Sydney does much better with them than puffs. Y’all can totally take Sam’s on. Your crew can even sit up in the cart side by side! Great — you’re now in second place…we keep on checking in andvoting every day! Wwww, thank you for reading and voting! Amber,I tried to vote,but I don’t think I’m doing something right! Thank you for trying to vote! If you do it correctly, you will click the badge (if it asks you to join Circle of Moms, just click the X in the right top corner to close), then click the pink heart under our picture. The heart will turn gray and say “voted”. You can vote again exactly 24 hours later.